We spent a week in the Charleston area. We stayed at a lovely county park with a campground located between Folly Beach and Charleston. It had hiking and biking trails, a dog park, RV and primitive campgrounds, a boating lake and water park. If we weren’t tooling around the park, we were at nearby Folly Beach playing in the surf. Sure, we went into town a few times to go to restaurants and do some shopping at the Charleston market, but we mostly enjoyed the out of doors. I suppose that is bound to happen when sun-starved Ohioans get a first taste of sun and 70 degree weather in February. They tell us that the weather here is unusually warm for February. Since we’re having unusual weather everywhere, that’s not surprising. Apparently everyone who can get away from Ohio chose to do so this month. In this one campground we met people from Westerville, Delaware, Coschocton, Buckeye Lake and Ostrander. We did head downtown a couple times to troll the shops along King Street and in the City Market. I was expecting something akin to the markets in Seattle or New Orleans, but the market in Charlotte had no fresh produce or meat for sale at this time of year. King street is lined with blocks of shops, though chain stores are slowly edging out the local merchants. Whenever it’s practical I try to shop local, but it’s getting tough to do. I went into a grocery I thought was a local chain only to find out it had recently been bought out by the Kroger company. On the plus side, my Kroger card worked at the checkout. I guess some corporate takeovers have a silver lining. The historic district of Charleston is packed with beautiful architecture, graceful trees draped with Spanish moss and more national register sites than are possible to count. Two places we visited will stay with me for a long time. We were strolling up Calhoun Street, laughing and talking about something when we noticed the rooftop and beautiful steeple of a church. The building was simple, with immaculately white-painted stucco walls. We came to the front and found ourselves standing in front of the Emmanuel AME Church. The gates were adorned by a white wreath. 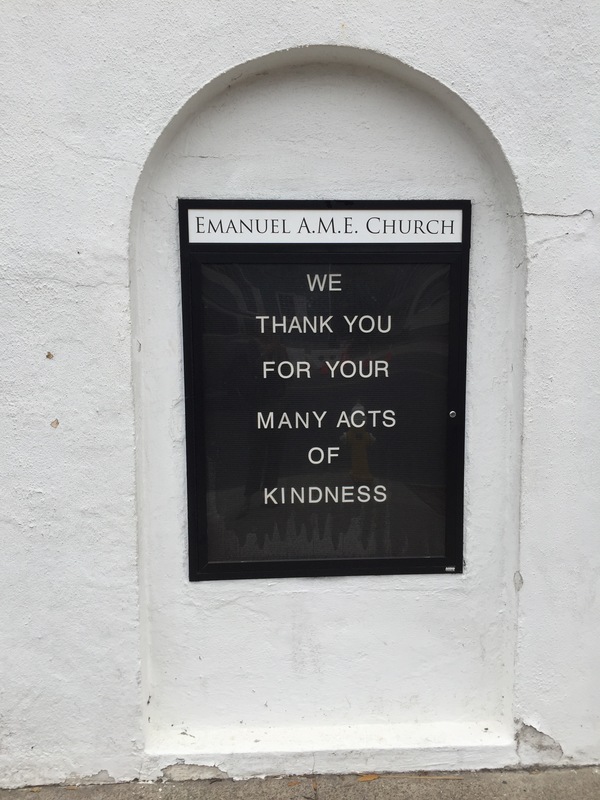 A simple sign near the front gate read “We thank you for your many acts of kindness.” We had talked earlier about finding the church, but hadn’t made any deliberate effort to look up the address or the street. I wondered how many tourists just roared by this place on the way to shop on King street, taking no notice of the simple white church. Regardless of how hokey it may seem to say this, I felt a chill to be standing in front of this place. At mid week, the church was closed and quiet. I read that the congregation and the community are both divided over the fate of Dylann Roof; some believe he should be put to death as sentenced; others have asked ‘if it was wrong for nine people to have their lives taken away, what makes it right to take the life of a tenth?’ The church still opens its doors to visitors, which to me is an act of incredible bravery and faith in God. “Mother Emmanuel” was founded in 1818. Ordinances in South Carolina and Charleston at that time limited worship services by black people to daylight hours, required that a majority of congregants in a given church be white, and prohibited black literacy. In the early years of the church, Charleston officials arrested 140 black church members and sentenced eight church leaders to fines and lashes. If you read the history of the church, it was harassed and burned many times over, and always rebuilt. Considering what its members must have borne witness to over the years, it’s no wonder the congregation has demonstrated such strength in the face of this most recent great tragedy. 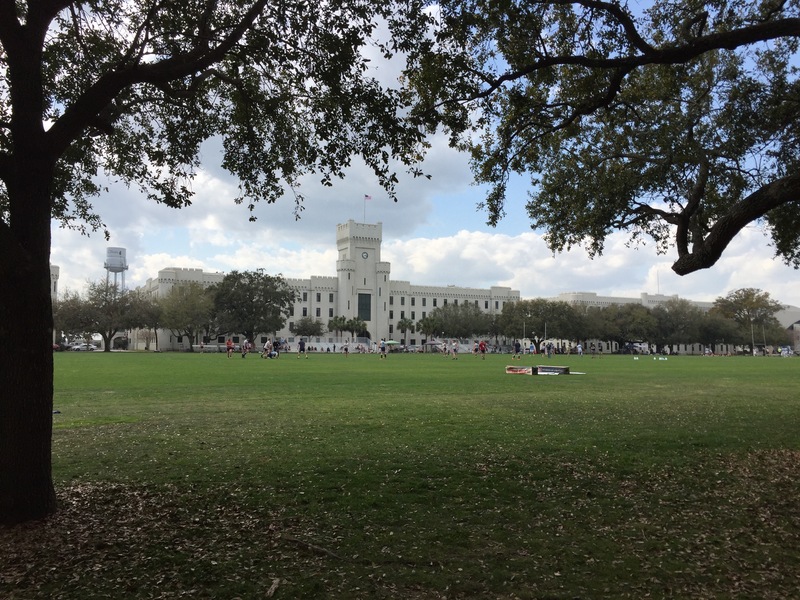 Later we visited the Citadel, one of the oldest military schools in the county, founded in the 1800s as the Military Academy of South Carolina. In 1910, the name was changed to The Citadel, Military College of South Carolina. It originated as a military arsenal, later converted to a school. According to the literature, the school’s role is to produce “civilian military leaders.” When you enter the campus, you pass by a statue commemorating the Cadet Ring. As is typical of such schools, graduates received much access to power and privledge. There is an interesting museum on the third floor of the library. There we learned that entire classes of students were conscripted into military service over the years of America’s several domestic and foreign conflicts, through WWII. The entire class of 1944 was drafted; in that year only 2 students from that class graduated. The campus is a series of white stucco buildings that look somewhat like a cross between a castle or fortress. Military equipment and missles decorate the edges of Summerall Field, a large green space. When we visited, there were rugby matches in progress. The school motto is “Honor, Duty, Respect.” Over the years the Citadel has had to deal with the realities of life in the Deep South. Research the history of the school and you will read about many instances where the school has had to decide where it stood with its values. African Americans and women won admittance to the Citadel through legislation and litigation. When we visited, the school was commemorating the 50th anniversary of the first African American graduates and the 25th anniversary of the first women graduates. To date, the college has stepped up when its students needed reminders that they are living in a more inclusive world. According to Wictionary, a citadel is a strong fortress that sits high above a city, or a stronghold or fortified place. Whether by rule of law or rule of faith, history will decide which of Charleston’s two great citadels will prevail.